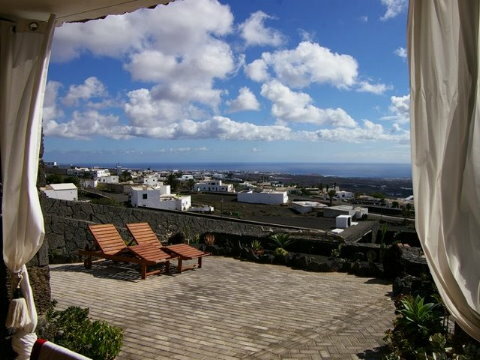 Oasis de La Asomada is a very beautifully located apartment with 2 bedrooms, situated in the still original Lanzarotian village of La Asomada, high above the coast of Puerto del Carmen. From the terrace one has a gorgeous panoramic view, beginning with the island capital Arrecife, via Puerto del Carmen and the Marina Puerto Calero, to the far south and the neighboring island of Fuerteventura. In the apartment there is a large living room with an open kitchen, all very tastefully furnished. It opens directly to the large terrace with its wooden furniture and great view. In the living room there is also a flatscreen television with SAT-TV, a stereo and, in addition, a 24 hour DSL high speed Internet connection is available. From the bedroom, and even from the bed, one can enjoy the magnificent view of the Atlantic Ocean. Although the second bedroom does not have the luxury of this beautiful view, it is nonetheless very comfortably equipped. In front of the house there is a terraced garden, and on its lowest level there is a heated ocean water pool and a barbecue grill. The property is located approx. 350 meters above sea level and accommodates not only the vacation apartment Oasis de la Asomada but also the main apartment, in which the landlord himself lives. The new golf course in Tias is in the meantime completed with 18 holes, it is about 4km away. 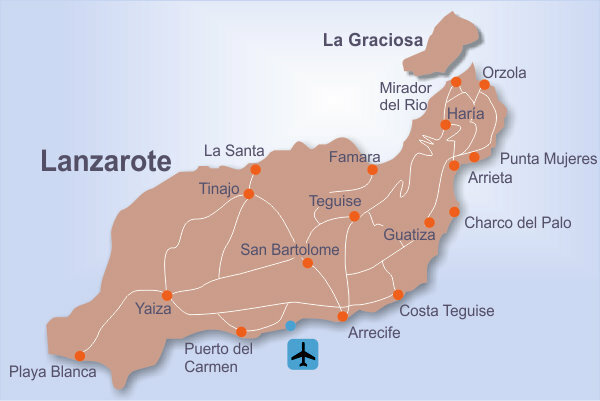 To Golf Costa Teguise you have to drive approx. 20 km. For stays that are longer than 2 weeks, a weekly change of laundry (bed sheets, towels, bathrobes) are included. Interim cleaning can be carried out for an extra charge of 50.- EUR. We would also be pleased to arrange an airport transfer or a rental car for you.